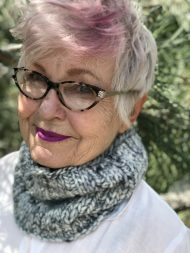 In honor of my Fall 2018 Knit For Fun Retreat in Edmonton, Canada, this thick and cushy cowl is designed to protect against frigid temperatures and blustery winds. The cowl shown used the entire skein of yarn; you will need more yarn if you choose to make a larger cowl. To adjust the circumference, cast on more or fewer stitches in groups of 4; every 4 stitches added or removed will change the circumference by about 11/2” (3.8 cm). Adding width will require reducing the length of the cowl if a single skein is to be used. To adjust the height, work more or fewer repeats of the 2-round pattern; every 2 rounds added or removed will change the height by about 1/2” (1.3 cm). Adding length will require reducing the circumference if a single skein is to be used. To ensure flexible cast-on and bind-off edges, use stretchy cast-on and bind-off techniques. The cowl shown was cast on using the Old Norwegian/Twisted German method, and bound off using the Sewn method.